در سـال‌هـای اخیـر شاخص‌های قابلیت اطمینان زیادی به‌منظور بررسی شبکه‌های آبی توسط پژوهشگران مختلف تعریف شده است، به‌طوری که کاربران و مدیران به‌دلیل پیچیدگی، تعدد و دامنه تغییرات ناهمگون نتایج برای شاخص‌ها، در به‌کارگیری آنها دچار سردرگمی هستند. در این پژوهش با در نظر گرفتن ویژگی‌های یک شاخص کاربردی که شامل نرمال بودن نتایج شاخص، حساسیت مناسب شاخص نسبت به تغییرات پارامترهای شبکه، تغییر جهت مناسب شاخص در شرایط حدی و قابلیت شاخص در پوشش شرایط بحرانی بهره‌برداری است، شاخص‌های قابلیت اطمینان هیدرولیکی و کیفی جدیدی ارائه شد. برای این منظور ضوابط و معیارهای طراحی و بهره‌برداری شبکه‌های توزیع آب به‌صورت کنترل حدود تغییرات حداقل و حداکثر و بهینه فشار در گره‌ها، سرعت جریان در لوله‌ها و کلر آزاد باقیمانده در گره‌ها در نظر گرفته شد و شاخص قابلیت اطمینان فشار گرهی، شاخص قابلیت اطمینان سرعت جریان لوله‌ای، شاخص قابلیت اطمینان کیفی گرهی و شاخص قابلیت اطمینان کل شبکه تعریف شد. برای ارزیابی عملکرد شاخص‌ تعریف شده، از یک شبکه نمونه دوحلقه‌ای و یک شبکه واقعی توزیع آب استفاده شد. بررسی مقادیر شاخص‌ها نشان داد که مقدار شاخص‌ها بین 11/0 و 0/1 در نوسان است و این تغییر نشان دهنده نرمال بودن و حساسیت مناسب شاخص‌ها است. همچنین با افزایش مقادیر هد و کلر باقیمانده مخزن، شاخص‌ قابلیت اطمینان تلفیقی شبکه‌ای از 54/0 به 75/0 افزایش یافته و سپس به 54/0 کاهش یافت و این تغییر نشان‌دهنده تغییر جهت مناسب شاخص در شرایط حدی است. همچنین با شکست برخی اجزای شبکه، مقدار شاخص‌ها تغییر محسوسی نکرد و این نشان‌دهنده قابلیت شاخص‌ها در پوشش شرایط بحرانی است. با نتایج حاصل از این پژوهش مشخص شد که در مجموع شاخص‌های تعریف شده از کارایی مناسبی برای ارزیابی عملکرد شبکه‌های توزیع آب برخوردار هستند. Various reliability indices have been defined by researchers for the water distribution networks. Due to the complexity and heterogeneous nature of distribution networks, results of indicies can vary substantially and municipalities have hard time to select the most practical indicies for their networks. This study was undertaken to develop a new method for identifying the best reliability index by considering various factors including the appropriate sensitivity to changes in network parameters, the appropriate shift in extreme conditions, the capability in covering critical condition, hydraulic condition, and water quality reliability. To accomplish the objective of the study, several water distribution networks were evaluated under multiple scenarios and the optimum reliability indices were verified with an example real water distribution network in Ahar. Controlling parameters included in scenario analysis for network reliability indices include: minimum, maximum and optimal pressure, residual chlorine in nodes, velocity in pipes, nodal pressure reliability, pipe velocity reliability, and nodal residual chlorine reliability . To evaluate the performance of defined index, a two-loop test (critical) were compared with the conventional single-lop test (normal). The performance assessment of indices obtained from this study showed that the index values ranged between 0.11 and 1.0, which indicate the normality and the appropriate sensitivity of the indices. Also, by increasing the residual chlorine of the reservoir, the network reliability index changed from 0.54 to 0.75 and then as the residual chlorine decreases in the distributon network the reliability index decreased back to 0.54. This appropriate shift in reliability index while changing residual chlorine in the network, cearly shows the the effectiveness of new method in determining the reliability indicies under extreme conditions. Also, the new method did not respond to the failure of some network components, as were evident with insignificant change in the indices values under critical conditions. From the results of this study generally can be concluded that the newly defined relability indices is an efficient way for evaluating the performance of water distribution networks. Alperovits, E. & Shamir, U., 1977, "Design of optimal water distribution systems", Water Resources Research, 13(6), 885-900. Awumah, K. & Goulter, I.C., 1992, "Maximizing entropy-defined reliability of water distribution networks", Journal of Engineering Optimization, 20(1), 57-80. Bazovski, I., 1961, Reliability theory and practice, Prentice Hall, Inc., Englewood Cliffs, N J.
Bhave, P.R., 1978, "Noncomputer optimization of single source networks", Journal of Environmental Engineering, 104, 799-813. Carrijo, I.B., Reis, L.F.R., Walters, G.A. & Savic, D., 2004, "Operational optimization of WDS based on multi-objective genetic agorithms and operational extraction rules using data mining", Proceedings of World Water and Environmental Resources Congress, Salt Lake City, Utah, USA. Coelho, S.T., 1996, "Performance assessment in water supply and distribution", PhD Thesis, Civil and Offshore Engineering Department, Heriot-Watt University, Edinburg, UK. Dini, M. & Tabesh, M., 2015, "A new method for simultaneous calibration of demand pattern and Hazen-Williams coefficients in water distribution systems", Journal of Water Resources Management, 28(6), 2021-2034. Ghajarnia, N., 2009, "Dynamic multi criteria design and development of urban water distribution network", MSc Thesis, Department of Irrigation & Reclamation Engineering, University of Tehran, Karaj, Iran. Filion, Y.R., Karney, B.W. & Adams, B.J., 2004, "Multi objective design of water networks with random loads", Environmental Informatics Archives, 2(2), 252-257. Gupta, R. & Bhave, P.R. 1996, "Reliability-based design of water-distribution systems", Journal of Environmental Engineering, 122(1), 51-54. Gupta, R., Sushma, D. & Pramod, R.B., 2009, "Water quality reliability analysis of water distribution networks", Proceeding of 33rd International Association of Hydraulic Engineering and Research Congress (IAHR), Vancouver, Canada. Jayaram, N., 2006, "Reliability based optimization of water distribution networks", MSc Thesis, Department of Civil Engineering, Indian Institute of Technology Madras, India. Kansal, M.L., Arora, G. & Verma, Sh., 2004, "Water quality reliability analysis in an urban distribution network", Journal of Indian Water Works Association, 36(3), 185-198. Ostfeld, A., 2002, "Reliability analysis of regional water distribution systems", Urban Water Journal, 3(4), 253-260. Prasad, T.D. & Park, N.S., 2004, "Multi objective genetic algorithm for design of water distribution networks", Jourmal of Water Resources Planning and Management, 130(1), 73-82. Tabesh, M., 1998, "Implications of the pressure dependency of outflows on data management, mathematical modeling and reliability assessment of water distribution systems", PhD Thesis, Department of Civil Engineering, University of Liverpool, England. 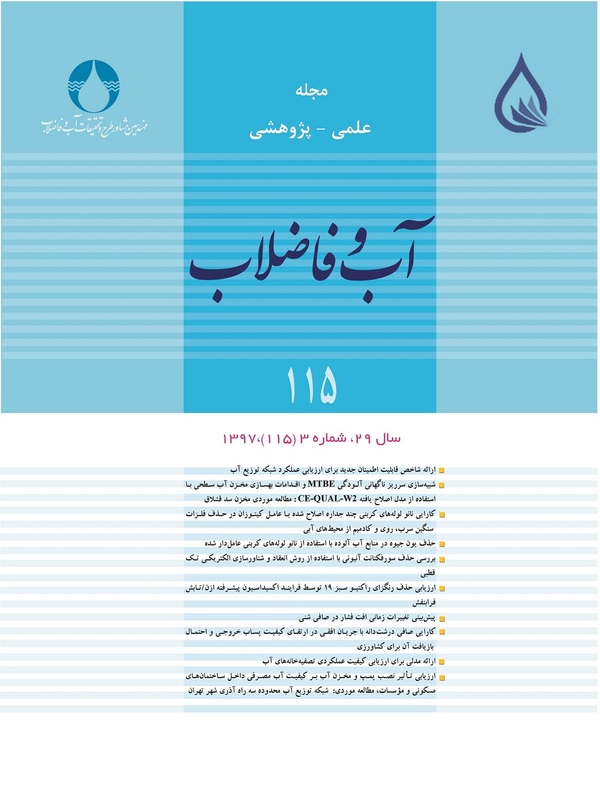 Tabesh, M. & Dolatkhahi, A., 2006, "Effects of pressure dependent analysis on quality performance assessment of water distribution networks", Iranian Journal of Science and Technology, Transaction B, Civil Engineering, 30(B1), 119-128, (In Persian). Tanyimboh, T.T., Tabesh, M. & Burrows, R., 2001, "An appraisal of source head methods for calculating reliability of water distribution network", Journal of Water Resources Planning and Management, 127(4), 206-213. Todini, E., 2000, "Looped water distribution networks design using a resilience index based heuristic approach", Urban Water Journal, 2(3), 115-122. Zhao, Y., Luo, B., Zhuang, B. & Zhao, X., 2010, "Hydraulic and water quality reliability analysis of water distribution system", IEEE 2nd Conference on Environmental Science and Information Application Technology, Wuhan, China.